Friday September 27th 1889 I ironed this forenoon and done lots of other work. I went to town soon after dinner and after doing shopping went down to Hatts awhile. I come home to help with the supper. Will went to the valley in afternoon. Saturday September 28th 1889 It was a fine day. I worked very hard all the forenoon sweeping up the house and fixing chow chow. Soon after dinner Will took me over to the fair ground to see the old settlers building the log cabin. We brought Aunt Sarah home with us. I done some work after I come home. Father brought Eugene Hart over to dinner and Jaime Stevens was here. I sewed in the evening. Saturday September 29th 1889 It was a rainy forenoon. I was busy about the house work and helping with the dinner. We put up some pears too. Ott was over for dinner and Hatt brought the children in the afternoon. I wrote in the evening. 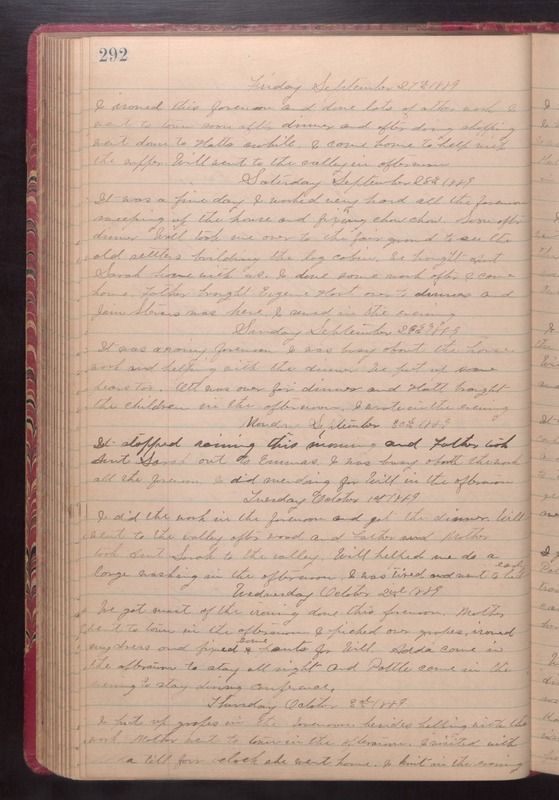 Monday September 30th 1889 It stopped raining this morning and Father took Aunt Sarah out to Emmas. I was bust about the work all the forenoon. I did mending for Will in the afternoon. Tuesday October 1st 1889 I did the work in the forenoon and got the dinner. Will went to the valley after wood and Father and Mother took Aunt Sarah to the valley. Will helped me dod a large washing in the afternoon. I was tired and went to be early. Wednesday October 2nd 1889 We got most of the ironing done this forenoon. Mother went to town in the aftrernoon. I picked our grapes, ironed my dress and fixed some pants for Will. Adda came in the afternoon to stay all night and Pottle came in the evening to stay during conference. Thursday October 3rd 1889 I put up grapes in the forenoon besides helping with the work. Mother went to town in the afternoon. I visited with Adda till four oclock she went home. I knit in the evening.